Last October, the appellate court overturned a previous decision by the New York Supreme Court that prohibited NYU’s $6 billion, 1.9 million-square-foot Greenwich Village expansion plan. But in Feburary, opponents of the plan (including community groups like GVSHP, Assemblywoman Deborah Glick, local residents, NYU Faculty against the Sexton Plan, and even actor Mark Ruffalo) announced that the New York State Court of Appeals would hear their case one final time. According to DNAinfo, though, today the state’s highest court ruled in favor of NYU, giving the expansion plan the final go ahead. 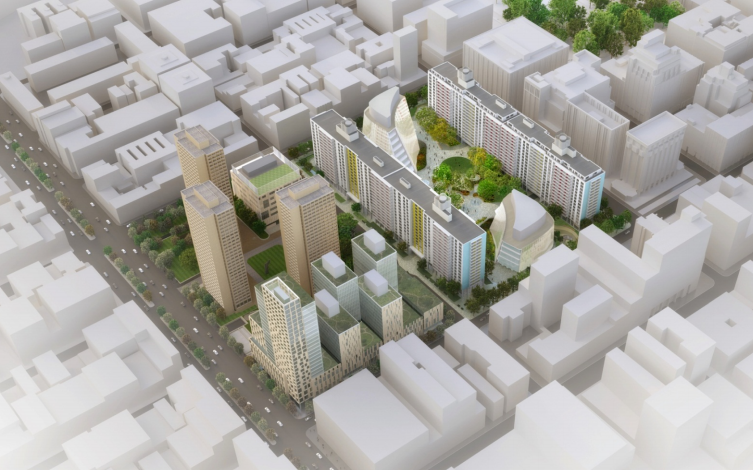 The basis of the opponents’ claim was that NYU was, as part of the expansion plan, taking “implied park land,” including a dog run, playground, and community garden, for private development. However, the court says that in order to officially be considered “implied park land” the opponents had to prove “that the owners of the land had done or said things that are ‘decisive’ and ‘unmistakable in their purpose’ to establish it as a permanent park, and that ‘the public has accepted the land as dedicated to a public use,'” reports DNAinfo. In the end, city documents showed that the parcels of land (the Mercer Playground, LaGuardia Corner Gardens, and LaGuardia Park) are owned by the Department of Transportation, who granted temporary use to the Parks Department. The opponents argued that since the sites have been used as parks for years, they met the second criteria, but the judge deemed that irrelevant, as they didn’t meet the first criteria. The entire memorandum from the hearing is available here.